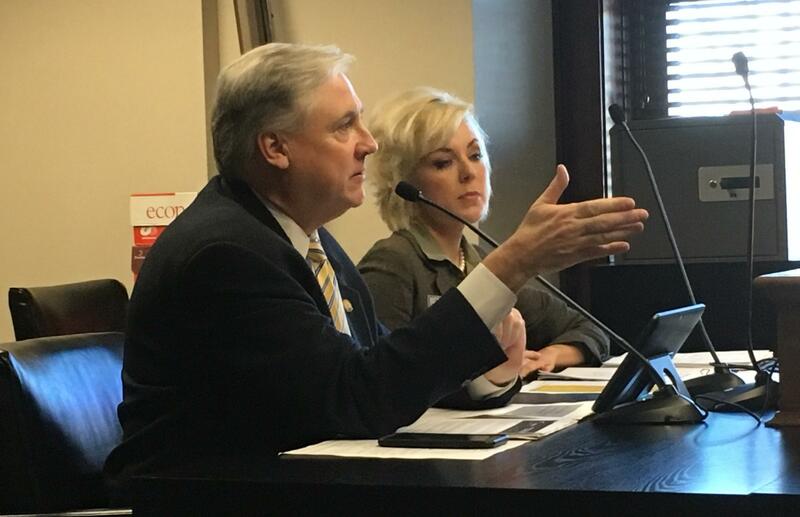 The bill's sponsor, Rep. Mark Lowery of Maumelle, speaks to the Arkansas House Education Committee Tuesday alongside Arkansas Department of Higher Education Director Maria Markham. Legislation that would change how Arkansas public colleges and universities are funded was approved Tuesday by the House Education Committee. It now heads to the full House for consideration. The "outcomes-based" funding model would incorporate factors like the number of students completing degrees, how long it takes to do, and how many graduate and then get jobs in their degree field or complete another degree. State Higher Education Director Maria Markham says it would be more effective than the current model, which is based on enrollment. "It’s moving all of Arkansas ahead in all groups of people, especially those that represent the biggest gap there, so our underrepresented minorities, our non-traditional students, and those with other risk factors. We want to get those people through the pipeline and into productive well-paying jobs," Markham said. Gov. Asa Hutchinson has been pushing for a change in higher education funding, calling the current model outdated. He has offered a $10 million increase if lawmakers back the change. Funding this year was flat at about $733 million in the state's overall $5.3 billion budget. But some members of the House Education Committee weren’t convinced by what they heard Tuesday. Rep. John Walker, a Democrat of Little Rock, suggested the funding model would benefit larger schools that attract higher achieving students who are more likely to graduate and "make the weak weaker and the strong stronger." He repeatedly questioned the assertions made about the bill by Markham and Rep. Mark Lowery, a Republican from Maumelle, who is the bill's sponsor. "It’s just a real problem in trying to bring about equity and fairness, especially when you’re trying to uplift everybody in the state," Walker said. Markham said a group of planners is working to anticipate which schools would be negatively impacted by the changes and how that can be offset. Having more students studying high-demand fields like math and sciences would provide more funding, she said. Rep. Jana Della Rosa, a Republican from Rogers, was concerned that the legislation at this point is "a shell bill," with specifics of the funding formula to be defined later. She wanted to make sure the panel will get a final say, asking "Can I get your commitment that this education committee will see this final model before it goes into effect, because that’s my issue here; that we are handing this off and it’s going to go to someone else." Markham said about 90 percent of the formula has been completed. She also said previous funding bills for higher education were handled the same way and that this would go before the Arkansas Legislative Council for a final approval of rules. To ward off drastic changes in funding year by year, the new model would cap any increases or decreases to an institution’s funding at two percent per year.